Facebook has launched a social gifting tool to turn forgetful, or just downright lazy, friends into a new revenue stream, as well as allowing more data to be collected on its users. 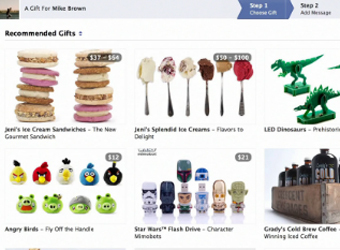 Facebook Gifts, which rolled out in the US overnight, will enable users to give gifts, such as cupcake orders, Starbucks store credit or items from other businesses that sign up to the program, to their friends. The option to give a gift will appear within birthday reminders and on friends’ Timelines. When clicked, a list of options will appear and the gifter completes the transcation with all the usual details, giving facebook access to credit card numbers, addresses and a raft of other information. Social gifting is an emerging trend which has attracted the attention of a number of startup businesses, including Wrapp which launched locally in August, enabling users to give Facebook friends free and paid gift cards from retailers including Lorna Jane, Industrie, Speedo, Roses Only and Booktopia. Facebook will profit by both taking a cut of the sales and collecting more data on their users. According to AdAge, Facebook currently takes a 30% cut of transactions made with virtual ‘credits’ purchased on the platform, which are almost entirely used for gaming. The product comes from the team that Facebook acquired in its acquisition of Karma, a gift-buying startup the company swallowed in May for $80 million, AdAge reports.